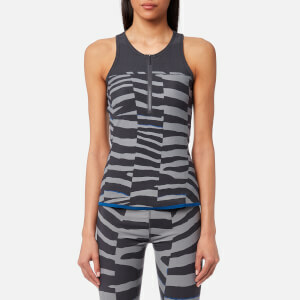 Women’s ‘Training’ tank top from adidas by Stella McCartney. Crafted from a ventilated Climacool® fabric designed to keep you cool and dry, the tight-fitting top comprises a crew neck, sheer mesh panels below the neck and sides for breathability and bonded seams for optimal comfort. Complete with a branded logo to below the neckline to the back.